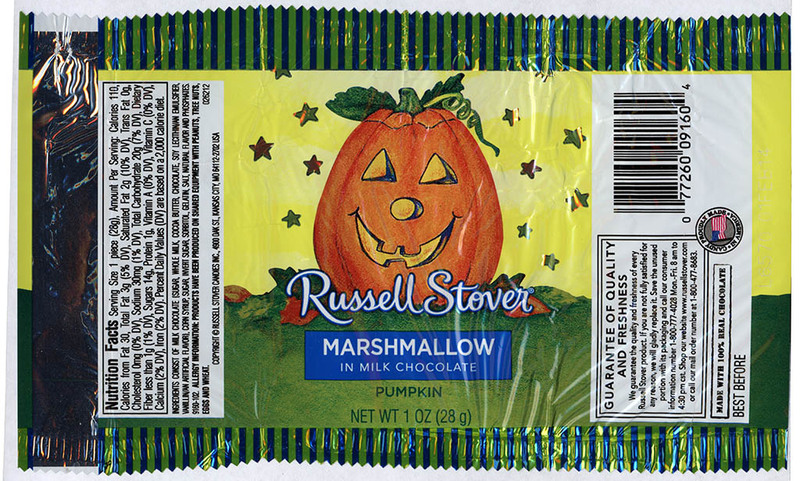 ← A 1960’s Brach’s Witch to Kick Off our 2013 CountdownToHalloween!! 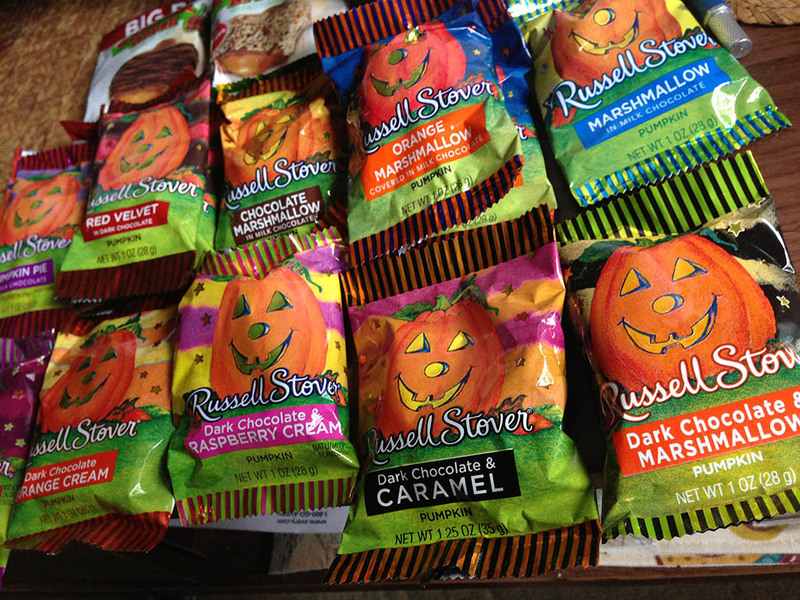 A Cornucopia of Russell Stover Halloween Pumpkins! 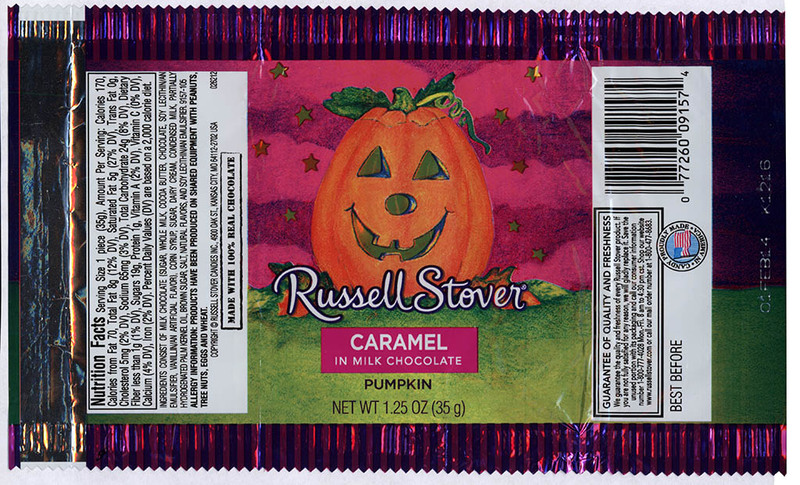 During a recent shopping trip to a Long Island Walgreens, I was assessing the Halloween candy assortment when I realized there were a lot of different styles of Russell Stover Pumpkins being offered. 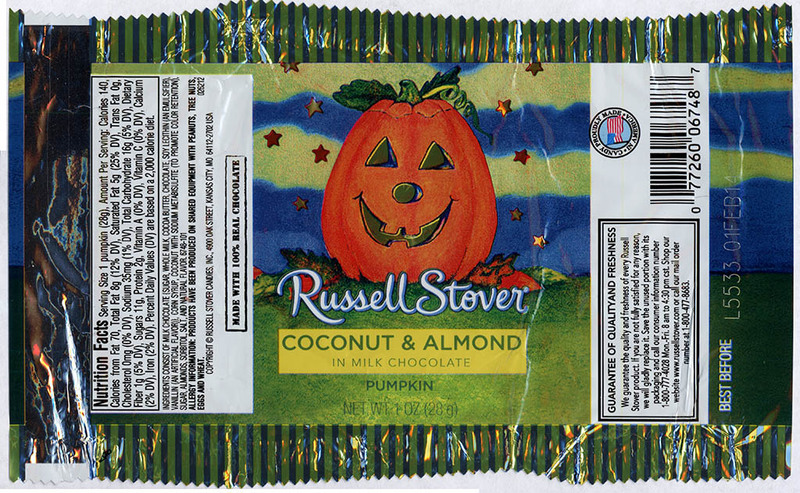 There were so many different examples — a cornucopia in fact — that I thought it warranted me dedicating a post to them all. 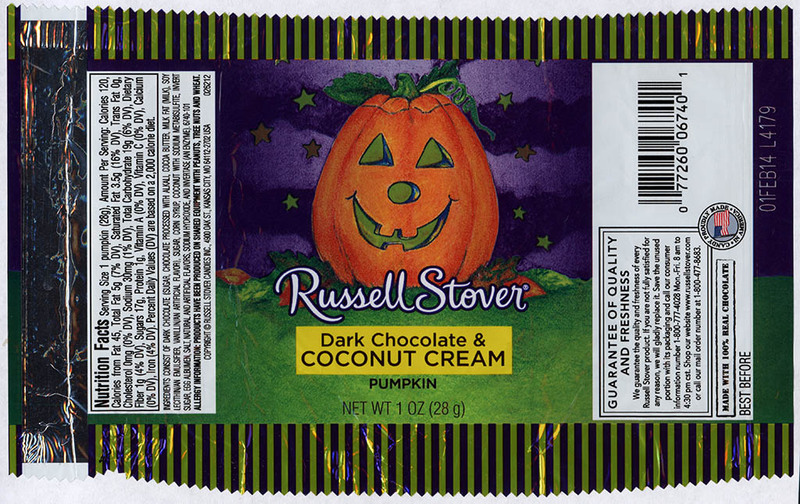 Before getting to today’s topic, I should note that this isn’t the first time I’ve looked at Russel Stover Halloween offerings as I dedicated a post to a few of them during my 2012 Halloween Countdown. But getting getting back to that recent shopping trip. 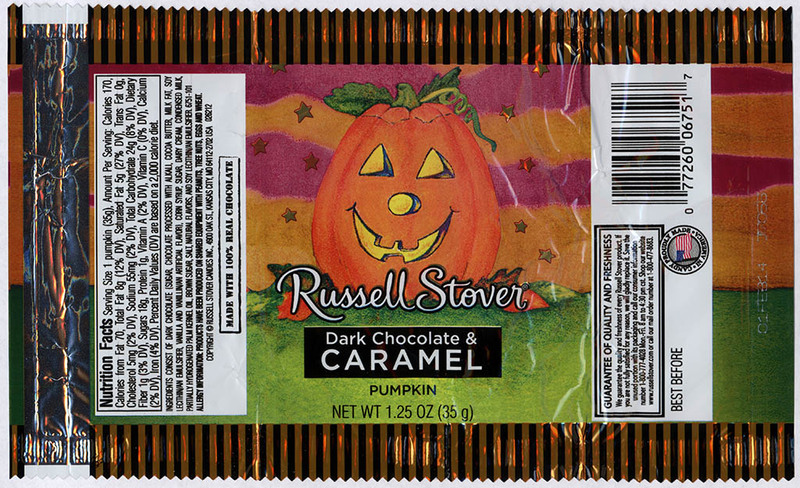 When I came to be standing there in front of all the different Russell Stover Pumpkin display boxes, I’ll admit to being surprised at the variety I saw. 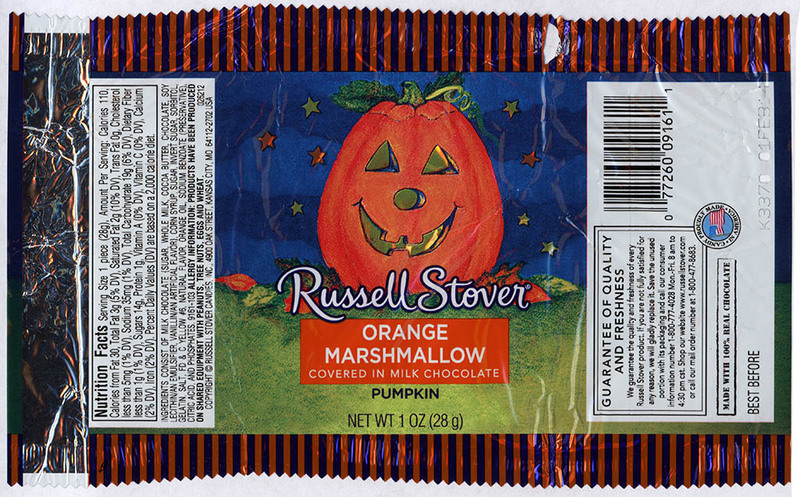 I’d dismissed these in previous years, and I’d never have guessed that there were more a few different versions. 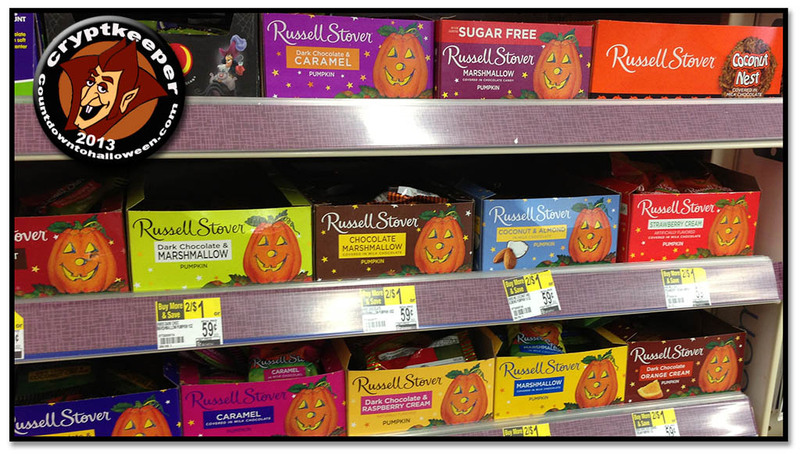 Russell Stover Halloween Pumpkins on display at Walgreens. 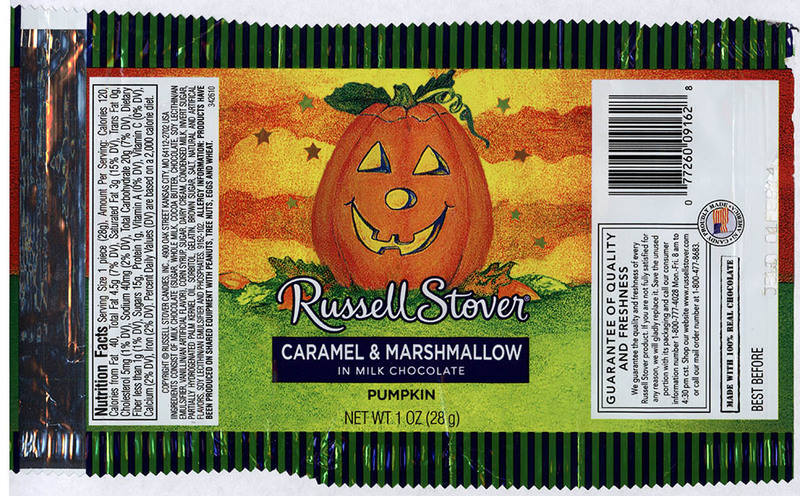 Having had my attention piqued and realizing that I wanted to write about them, I grabbed a shopping cart and quickly filled it up with examples of each and every Russell Stover pumpkin there. When I got home, I laid them out to count how many there were. 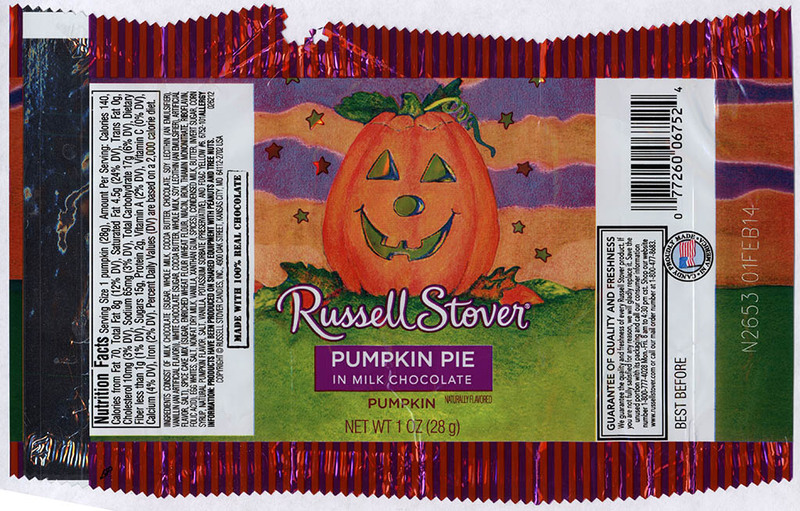 Russell Stover Halloween Pumpkins all laid out. 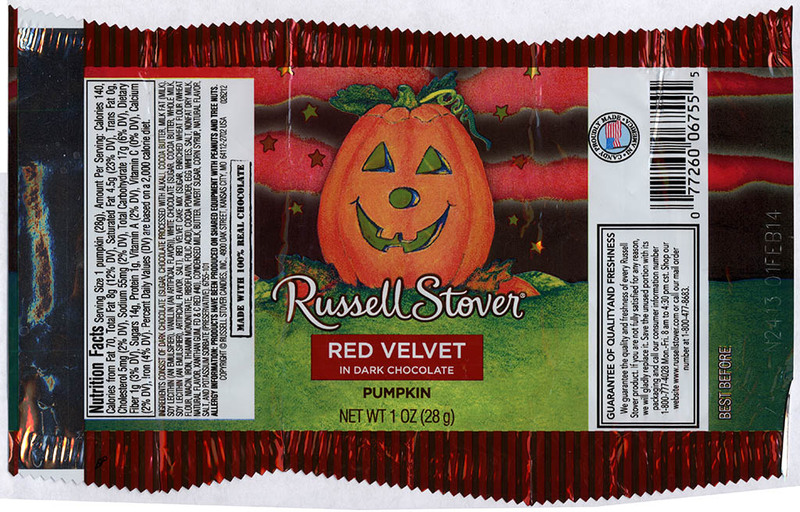 A quick tally indicated that I’d purchased seventeen pumpkins, but somehow I doubled up on an Orange Pumpkin and a Red Velvet – so after weeding out the duplicates, I had fifteen different Russell Stover Halloween Pumpkins in front of me — astounding! 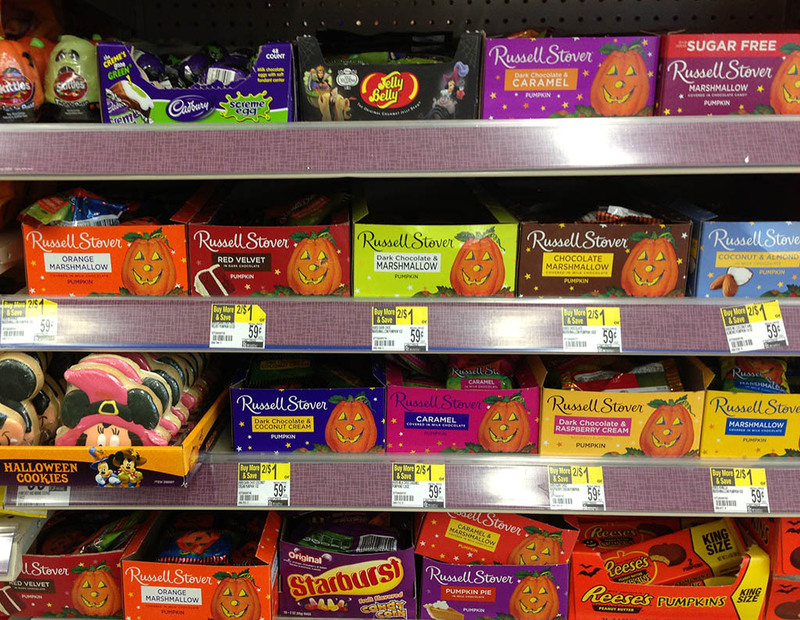 That’s quite a lot of variety for a seasonal offering like this, and as I’ve already stated – I’d never have guessed that there were this many. And heck, there might even be more, as I’m not sure that this is the complete assortment – but it’s certainly all they had on display where I was shopping. That’s all of them. 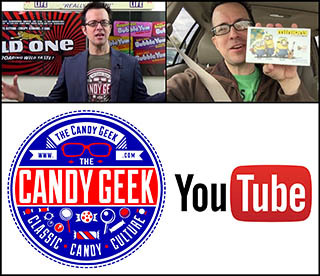 I think it’s remarkable how my collector-mind works. 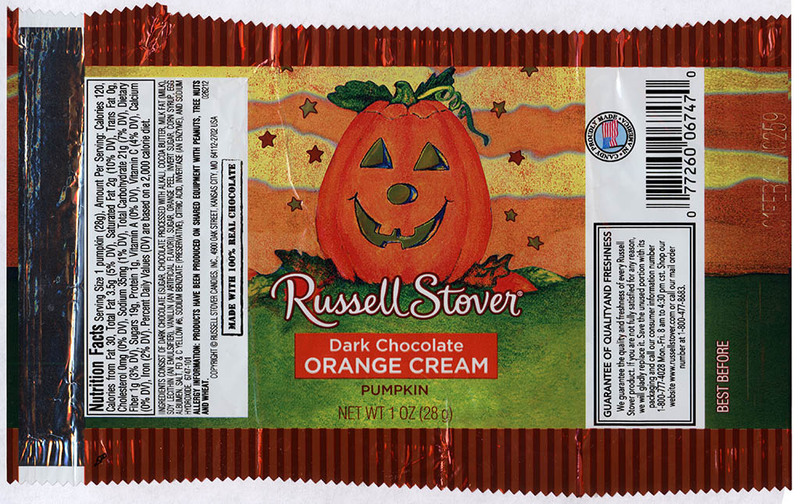 A single version of these Russell Stover pumpkins is something that’s easy to overlook, but when it becomes a rich assortment like this, it’s suddenly much more compelling fare. 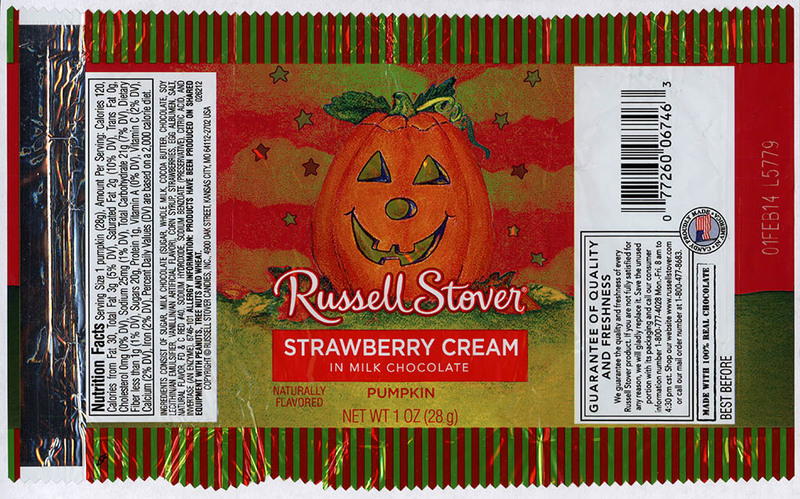 And that’s everything for today’s CountdownToHalloween coverage of this bountiful collection of Russell Stover Halloween Pumpkins. See you next time! 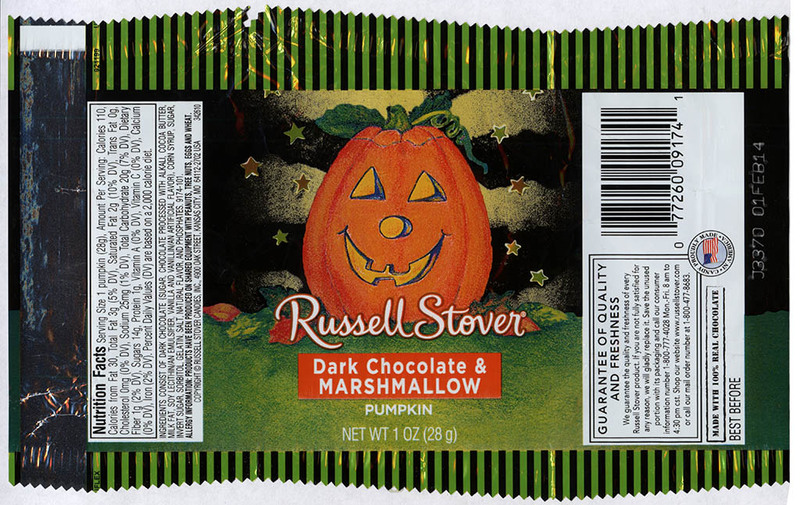 Today’s post has been part of CollectingCandy.com’s 2013 Countdown to Halloween. 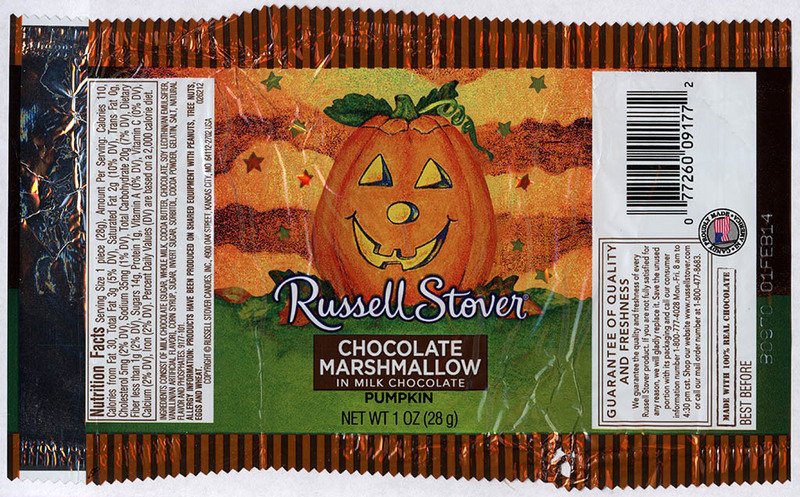 To check out other sites celebrating Halloween all month long, check out the official CountdownToHalloween site. 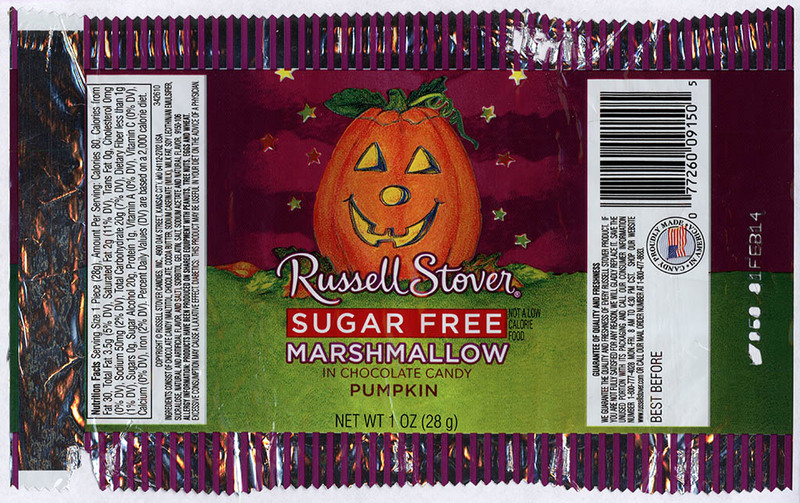 This entry was posted in Chocolate, CountdownToHalloween, Halloween, Holiday and tagged candy collecting, candy collection, candy collector, candy wrapper collection, candy wrapper collector, collectible, collecting candy, confectionery, confections, Halloween, packaging, pumpkin candy, Russell Stover, sweets, vintage candy wrapper, wrapper. Bookmark the permalink. 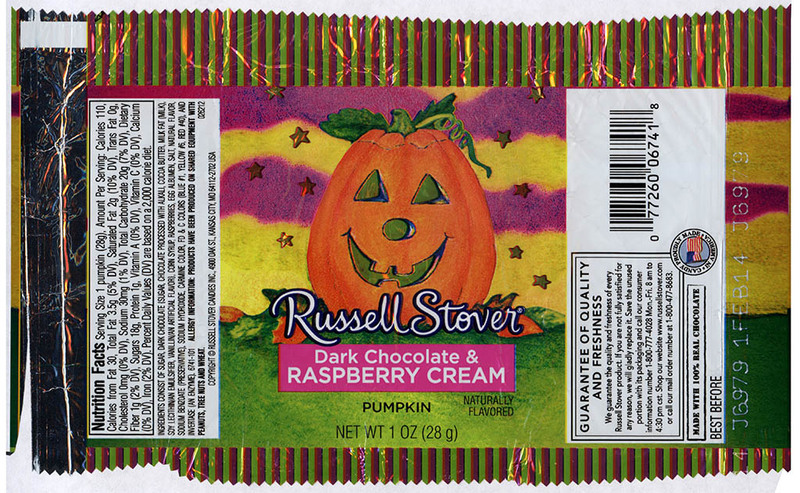 1 Response to A Cornucopia of Russell Stover Halloween Pumpkins!